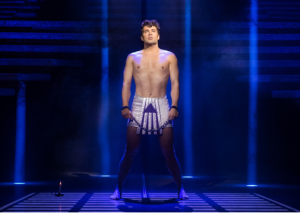 Joe McElderry follows a long list of successful Josephs and certainly has a lot to live up to as Bill Kenwright (director) and Tim Rice’s (lyrics) production of Joseph and the Amazing Technicolor Dreamcoat arrives at Cardiff Bay’s Wales Millennium Centre. The production is a contemporary take on the biblical tale – Joseph, the favoured son of Jacob, is envied by his 11 brothers and the gift of a glamorous multi-coloured coat from their father is the final straw. The brothers take matters into their own hands and sell Joseph into slavery, where he’s carted off to Egypt. However his ability to decipher dreams changes his fortunes as he warns the Pharaoh of a seven year famine, a favour which earns him the title the Prince of Egypt. The brothers, struggling to survive due to the famine, decide to venture to Egypt to beg the prince, who unbeknownst to them is their brother Joseph, for aid. The set and staging is subtle but effective and aids in setting the scene and helps the plot to develop. The lighting is also used very effectively, particularly as Joseph reels through the colours of his coat. The stairways are lined with an on-stage choir made up of children from the Bristol School of Performing Arts who give a lovely medley of the musical numbers as Act 2 was introduced – a nice touch. Lucy Kay, a former Britain’s Got Talent semi finalist, narrates the tale through song and demonstrates a fantastic voice with an impressive vocal range. The musical numbers are performed in a number of styles, including calypso, country, gospel choir and the Pharoah as Elvis. Some of which worked excellently, such as the country style version of “One More Angel in Heaven” and a Parisian-themed “Those Canaan Days,” led musically by an accordion. I wasn’t fully convinced by the Elvis-themed Pharoah (played by Ben James-Ellis); he certainly possesses an infectious energy and delivered his comedic lines very well, but his vocals did occasionally let him down. Similarly, the calypso/flamenco themed number appeared a bit cheap and I didn’t really understand its purpose. The band of brothers all performed excellently, with energetic dance routines and great singing voices. McElderry clearly has an outstanding voice, and arguably is the most talented Joseph to date, but his and others’ articulation was often muffled and unclear, which did hinder the delivery of the narrative. With the whole production being sung, the lyrics are obviously essential to understanding and following the story line. The number “Close Every Door” was an exception to this and a highlight of the performance. McElderry’s voice really shone through during this number and also demonstrated his acting ability, performing with ease and confidence. The production is certainly energetic, colourful and engaging and will appeal to audiences of all ages. There were a few minor irks that detracted from the production as a whole, but with an extremely talented cast, the performance was enjoyable nonetheless.